Preheat oven to 350 degrees. Thinly slice a baguette and place crostinis on a baking sheet lined with parchment paper. Drizzle crostinis with olive oil. Season lightly with kosher salt and fresh ground pepper Flip crostinis over to get oil on both sides. Season lightly with kosher salt and fresh ground pepper on other side. Bake for 10-15 minutes or until crostinis are dry and lightly golden. Set to the side in an air tight container or plastic bag. Can be done several days ahead. Heat a medium size skillet over medium heat for about five minutes. Season steaks with your favorite steak seasoning or with sea salt & fresh ground pepper. Cook 6 minutes. Flip and cook an additional 5 minutes for medium rare. The internal temperature should be 125 degrees. The temperature will rise while the steak is resting. Rest for 15 minutes before cutting. Cut into thin slices. This can be done one day ahead. In a medium sauté pan, melt the butter and add the olive oil over medium high heat. Add the mushrooms and cook until all the liquid has absorbed. Deglaze the pan with the sherry. Add the balsamic vinegar, Worcestershire sauce and salt. Can be made a day ahead. Reheat before serving. Combine all the ingredients and mix thoroughly. Best if made a day ahead to let flavors develop. Crostini, .05 lbs. 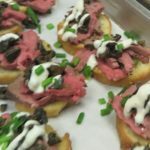 Beef Tenderloin (thinly sliced), 1 tablespoon Mushroom Duxelle, a dollop of Horseradish Cream. Garnish with Fresh Chive, chopped.